Fine dining in a mall? Generally not a good sign, except when the mall in question is South Coast Plaza, arguably the premier shopping center in the country (and certainly tops when it comes to gross revenue). 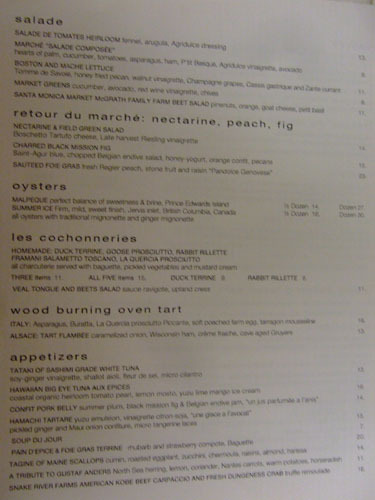 Housed in the old Troquet (from famed OC restaurateurs Tim and Liza Goodell) space, Marché Moderne ("modern market") is indeed a modern take on the French bistro. 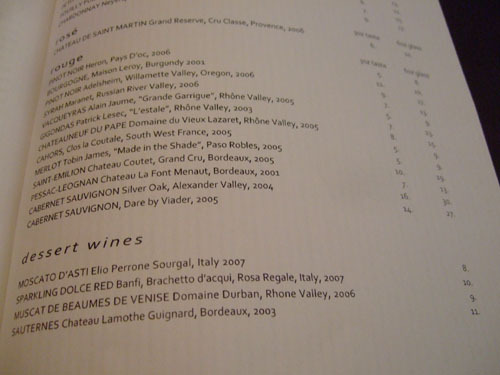 Its chef/owner is none other than Florent Marneau, who was previously the Executive Chef at Pinot Provence (part of the Patina Group). 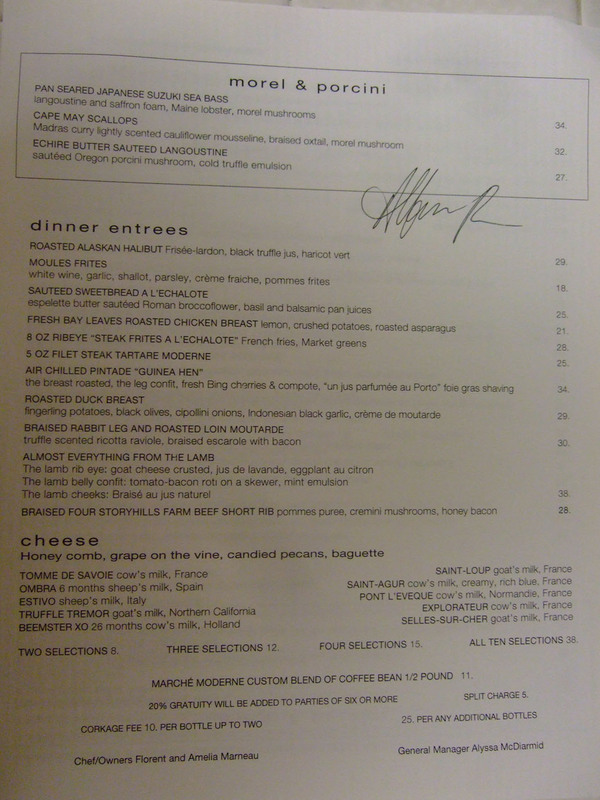 Before that, he was at Patina proper, Aubergine (the Goodell's former flagship in Newport Beach), and Pascal. Wife Amelia serves as pastry chef. 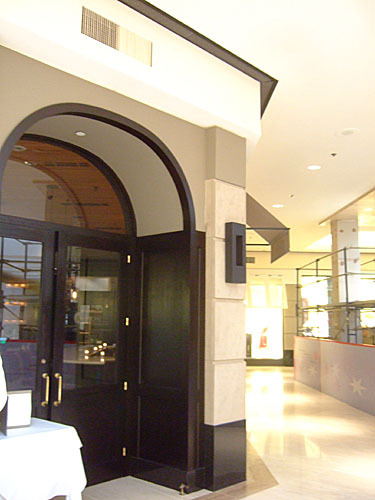 Marché Moderne is one of the few establishments (along with Canali, Christian Louboutin, Oscar de la Renta, and St. John) on the mall's third floor "Penthouse", near the Nordstrom wing. 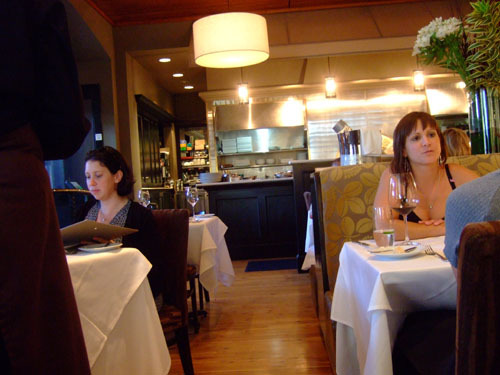 The dining room is French in style, while being quite comfortable and inviting. 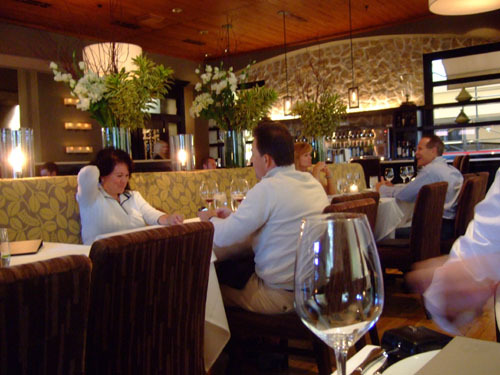 A row of banquettes dominates the room, while a small bar sits in one corner; nearly everyone has a view of the open kitchen and wood-burning oven. 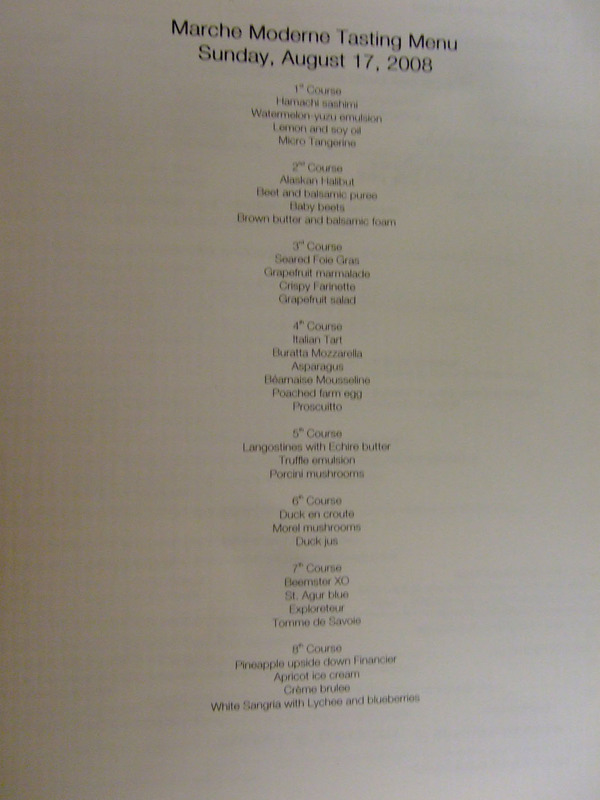 The menu is fairly diverse, with a wide variety of interesting starters and mains. 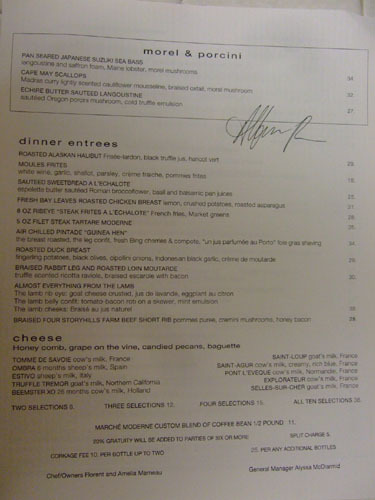 We chose the 5-course tasting menu at $79, together with appropriate wine pairings; the rightmost photo is the special menu that the restaurant typed up at our request. Click for larger versions. The wines by the glass list provides a good selection of mostly French wines. I appreciate the offering of smaller 3-ounce tasting portions. Click for larger versions. 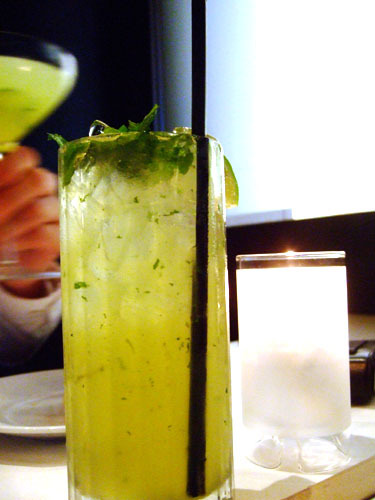 As usual, I started with my mojito [$13.00]; it was a decent example, a bit tarter than normal, with the mint perhaps not apparent enough. 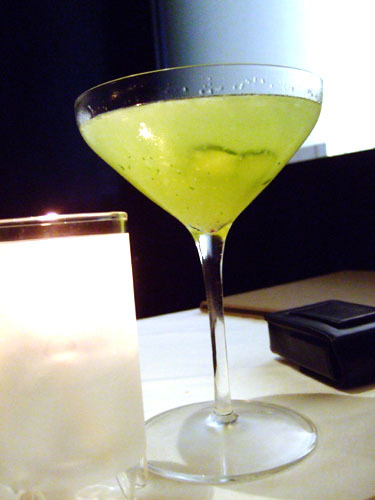 My dining companion chose a cucumber gimlet with Grey Goose [$11.00], which I thought was quite delicious, albeit very cucumber-y. 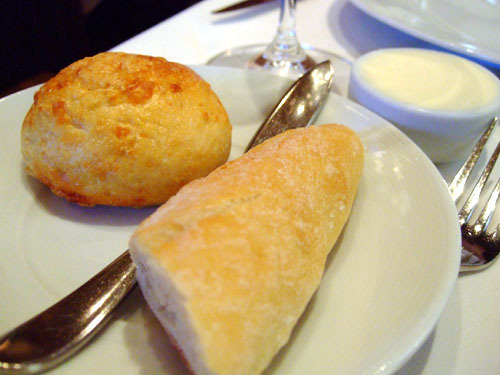 Cheese bread and traditional baguette were the two breads on offer. The paprika imparted a bit of kick to the tuna, which was nicely tempered by the subtle sweetness of the ginger-carrot-apple sauce. 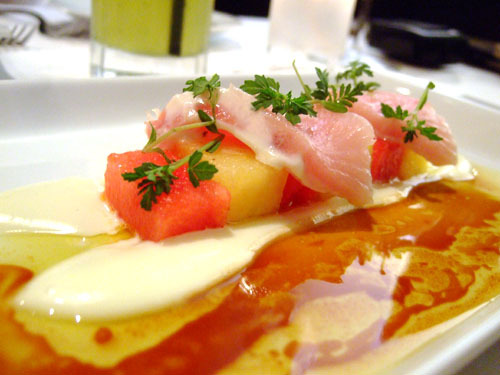 Sumer watermelon, watermelon-yuzu emulsion, lemon and soy oil, micro tangerine. 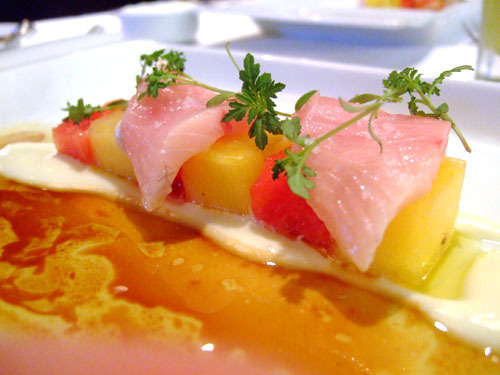 The hamachi was good enough to have stood on its own, but I was initially a bit concerned about all the flavors that were going on here (bad memories from Charlie Palmer perhaps). My fears were unfounded however, as the watermelon just added a touch of sweetness, along with a pleasing textural contrast, and the sauce didn't overpower. 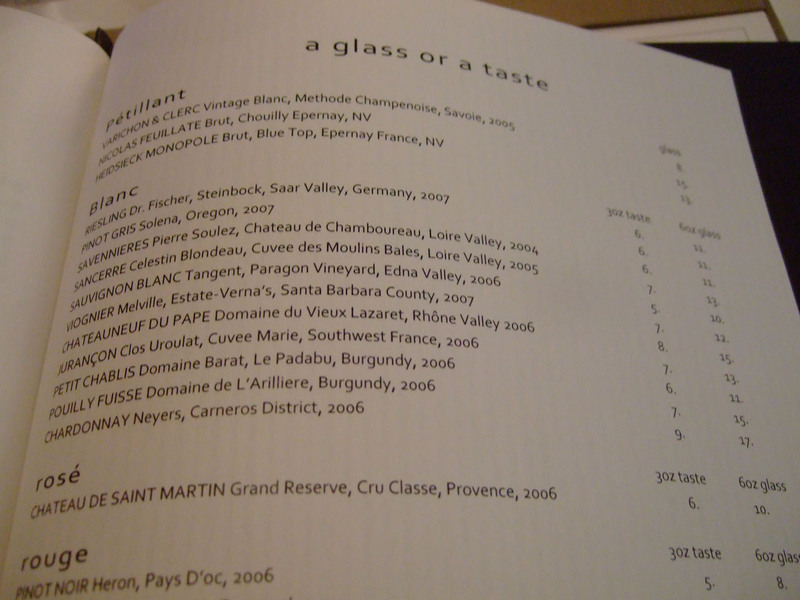 Unfortunately I wasn't a huge fan of the paired Champagne, which I found a bit harsh. Beet and balsamic purée, McGrath Family Farms baby beets, brown butter and balsamic foam. 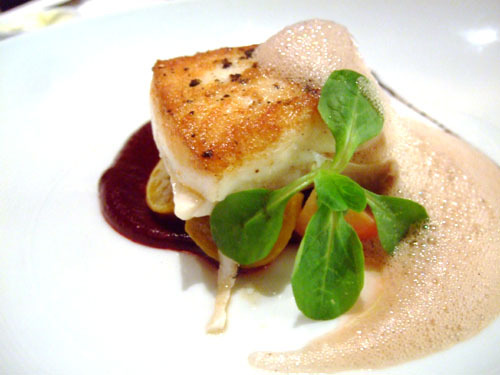 Halibut has always been one of my favorite types of fish, especially in a fully cooked preparation. Here it did not disappoint; the fish's consistency was spot on, flaky on the bottom yet crispy up top, while the flesh was wonderfully cooked, juicy, and powerful in flavor. 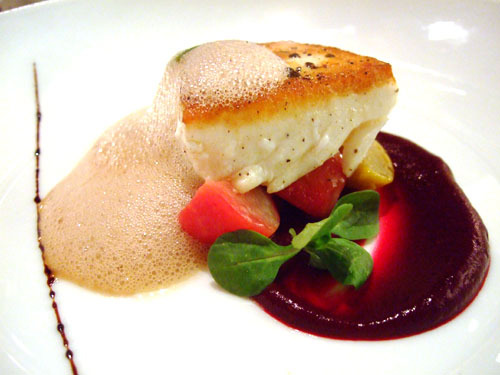 I could've done without the beets however, as they only tended to distract from the natural flavor of the halibut. 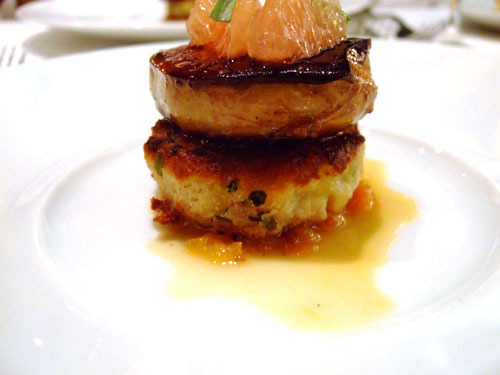 Grapefruit marmalade, crispy farinette, tarragon grapefruit salad. 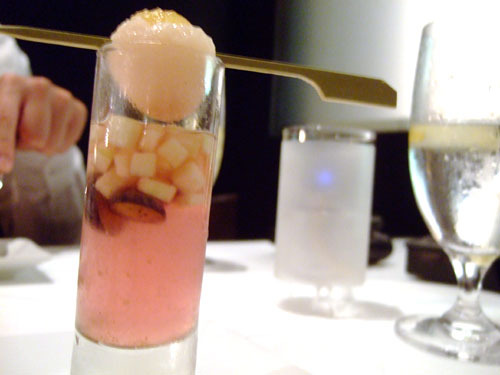 With grapefruit both on top and on the bottom, I thought this preparation of foie gras was overly sweet. 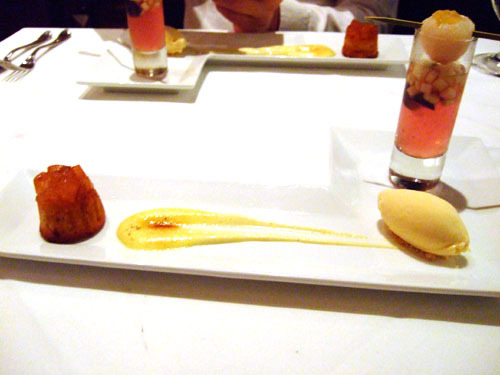 Especially when paired with the Sauternes, this sweetness completely overpowered my palate. A bit lacking in finesse perhaps. 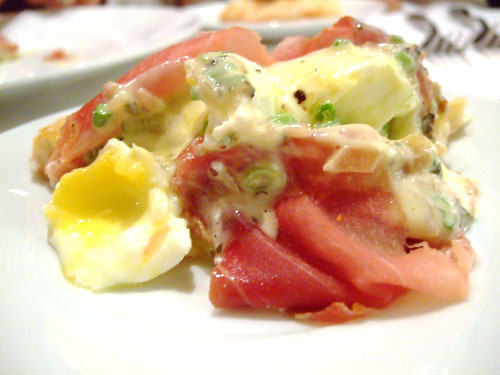 Of note, a farinette is a pancake- or omelet-style item from France, typically made with egg, flour, and milk. 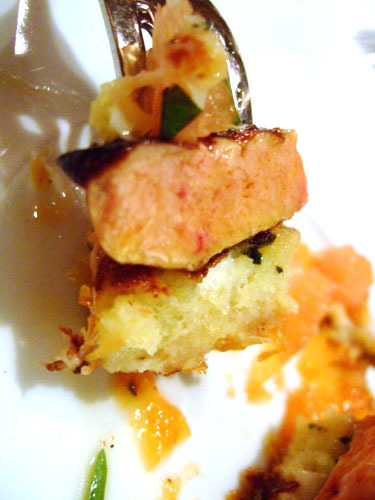 I'd like to try a version by itself, as the farinette here was lost in the foie gras. Asparagus, Burrata, La Quercia prosciutto Piccante, soft poached farm egg, tarragon mousseline. 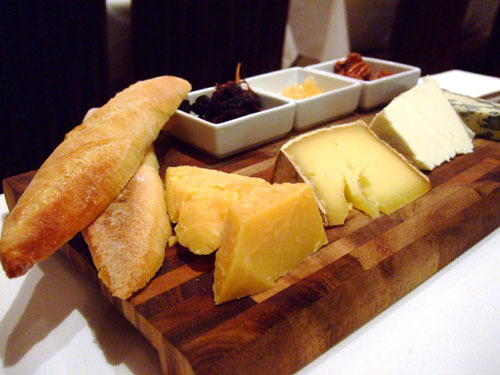 La Quercia is a producer in Iowa that provides quality cured meats to a number of leading restaurants. 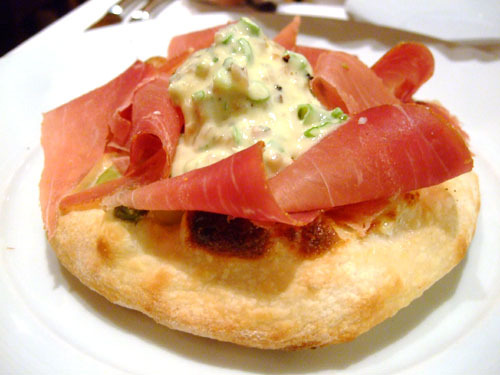 The prosciutto Piccante here had a bit of spice to it, which formed a great interplay with the other, milder ingredients in the tart. I loved the creamy contrast to the crisp crust provided by the combination of Burrata, egg, and mousseline. Sautéed Oregon porcini mushroom, cold truffle emulsion. 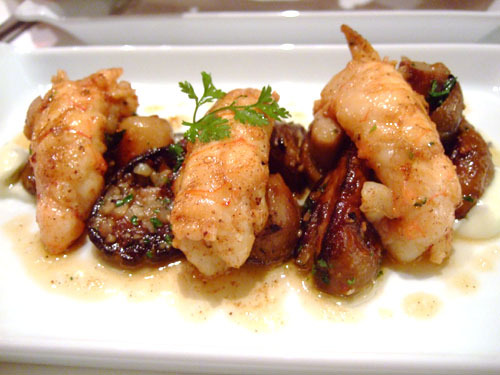 Also known as the Norway lobster, langoustine is fairly comparable in taste to the typical American and European varieties, but I'd say that the flesh is perhaps a bit richer and heavier in flavor. 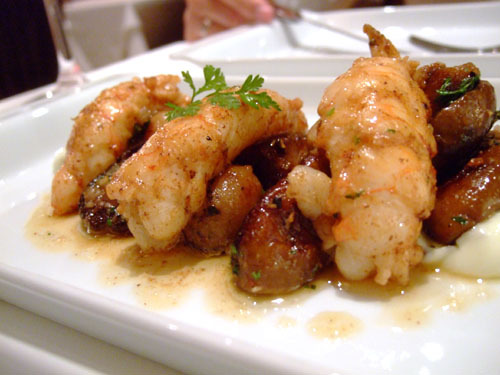 In any case, the langoustines themselves were quite tasty, though a tad overpowered by the porcinis. Unfortunately the truffles here weren't nearly apparent enough in my opinion. 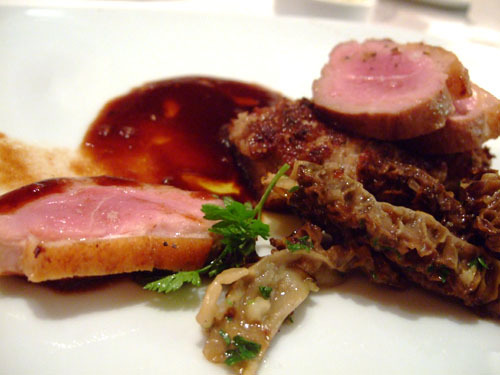 Duck breast, morel mushrooms, duck jus, foie gras and confit duxelles, red wine sauce. Unfortunately I thought the duck was a bit overcooked and thus rather tough and weak in flavor. The morels, and to a lesser extent the duxelles, sort of took center stage away from the duck, which shouldn't have been the case. Beemster XO (26 months cow's milk, Holland) - A hard, crumbly cheese, with a sharp, slightly nutty flavor, this almost reminded me of Parmigiano-Reggiano. Tomme de Savoie (cow's milk, France) - A semi-firm cheese from the French Alps, Tomme de Savoie is made from the skim milk left over after the cream has been removed, and as a result, is low in fat with a mild, nutty flavor. Explorateur (cow's milk, France) - Named after the US spacecraft Explorer, Explorateur is a triple cream cheese from Ile-de-France with a fat content of roughly 75%. 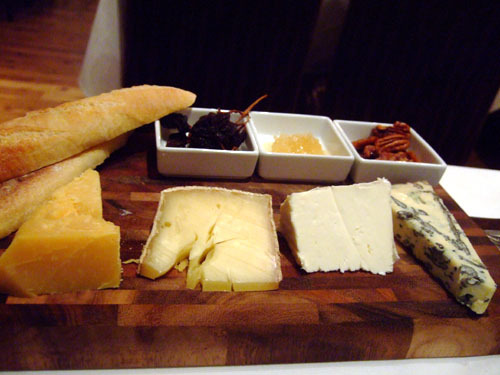 The cheese had a smooth, light appearance with a rich, pungent, salty taste. Saint-Agur (cow's milk, creamy, rich blue, France) - Saint-Agur is made from pasteurized cow's milk, enriched with cream, and contains 60% fat. A double cream, the cheese was rich, spicy, and a bit salty. 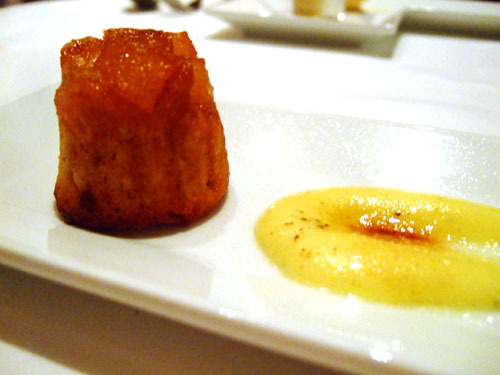 Pineapple upside down Financier - A financier is a light tea cake from France, often topped with fruit, in this case pineapple. Tasty but forgettable. 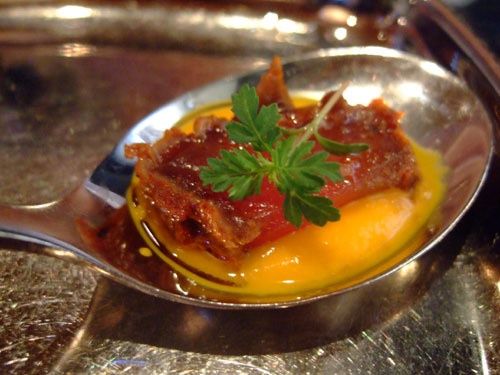 Crème brûlée - The "crème brûlée" was pretty much a smear of caramelized custard on the plate, so there wasn't much to go off of here. 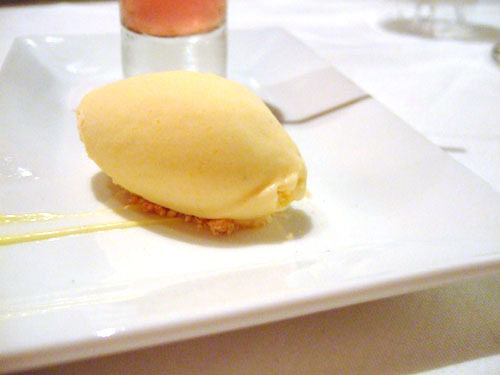 Apricot ice cream - This had a very nice intense, yet light, apricot flavor. White sangria with lychee and blueberries - Very tart and a overpowered by the apricot liqueur. 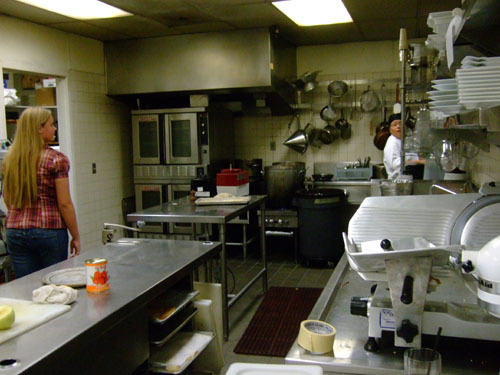 Chef Marneau wasn't in on this particular night, but we did get to tour the kitchen with his chef de cuisine. Unfortunately I can't recall his name. 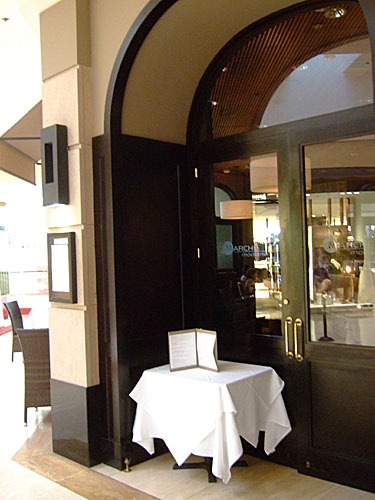 I was a bit skeptical going in, but in my opinion, Marché Moderne has firmly established itself as one of Orange County's top dining destinations. 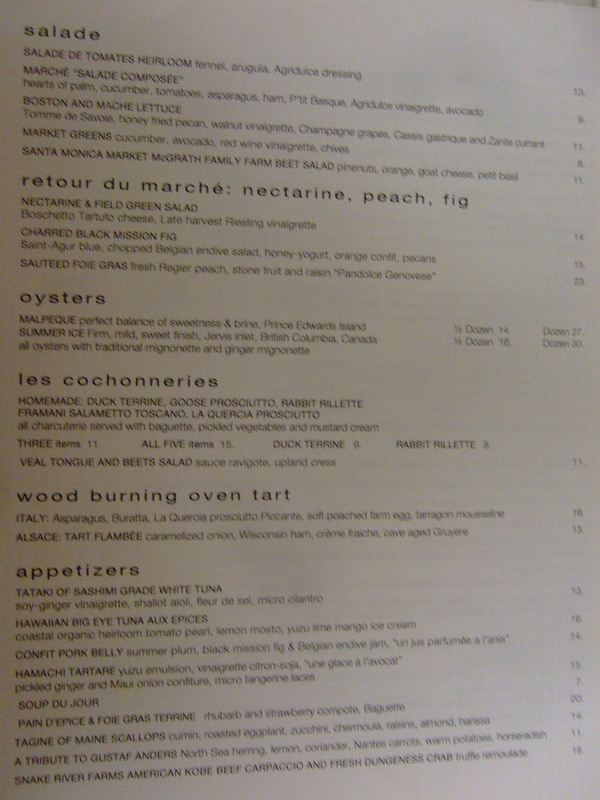 While we may mourn the loss of eateries such as Troquet, Aubergine, and Gustaf Anders in the past several years, Marché Moderne is well positioned to create a new standard of culinary excellence in the county, and I look forward to it. Great review Kevin. Glad to see that, despite some errors, there's a place for good food at the mall. Can't wait for more reviews! Thanks Cuong! This place definitely makes you forget that you're inside the mall. I've heard good things about this place and the food definitely seems appetizing. 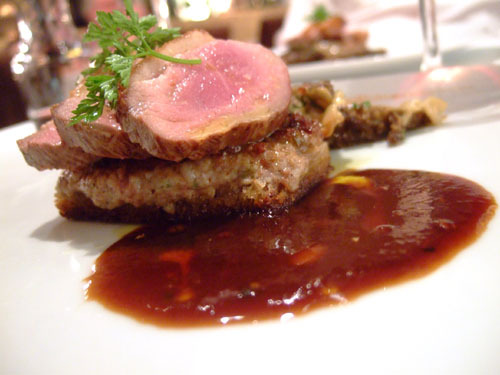 Yep, if you're looking for French fare, this is definitely one of the strongest places in OC. I've loved it every single time I've gone - good for either lunch or dinner! I just went back on Monday--look out for a post in the coming days! how do you see what is on their tasting menu? i don't see it on their website? also....so they don't mind foodies taking pictures in their restaurants? i always feel so self conscious taking pics in a nice restaurant! Yeah the tasting menu isn't normally listed; you just have to ask for it. It'd be a nice place for an anniversary; I'd actually call ahead so you can talk to them about doing a special menu. As for the photos, very few restaurants seem to have a problem with it. Just take the pics, and ask permission later! 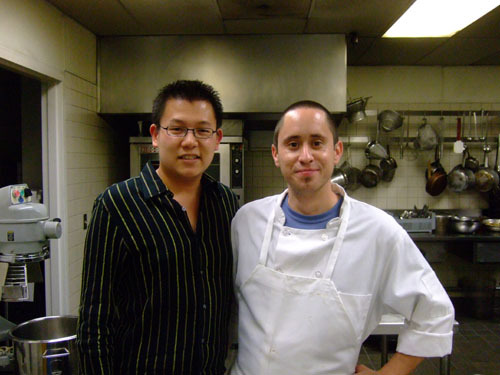 The chef de cuisine was Chef Alfonso Ramirez, now the executive chef at Pinot Provence. Come in and check out his fare, Kevin!